Hailing from the decaying rust belt city of Detroit, Tyvek brought their crunchy proto-punk to Toronto's green island. They were the fourth band to go on for the first day of this year's ALL CAPS! Island Festival, and their fast-paced set helped to rev up the energy for the rest of the evening. Although the band operate in the rudimentary form of their hometown forbearers the Stooges and the MC5, their hooks and melodies feel refreshing and new. On "Air Conditioner," off the Fast Metabolism singles collection, bespectacled lead singer and guitarist Kevin Boyer wrought something profound from the seemingly mundane topics of air conditioners, television and Whole Foods. With "Say Yeah," the band bashed along with the kind of hardheaded simplicity that has given punk its vitality since the genre's earliest days. 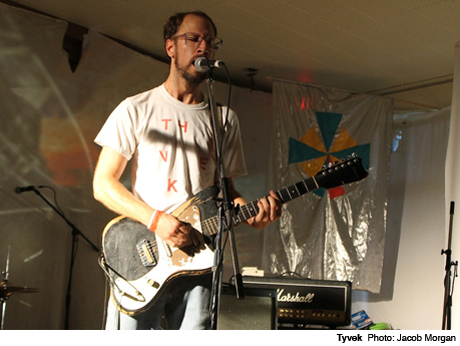 Like Tyvek's songs, their performance ended abruptly and left the audience impressed and craving more.